When we think of Imagineering, we think of Disney theme parks. But Imagineering is a creative process that can be used for nearly any project, once you know how it works. Lou Prosperi distills years of research into a practical how-to guide for budding "Imagineers" everywhere. The Imagineering Process is a revolutionary creative methodology that anyone can use in their daily lives, whether at home or on the job. Prosperi will teach you first how the Disney uses the Imagineering Process to build theme parks and theme park attractions, and then he'll show you how to apply it to your own projects, "beyond the berm." 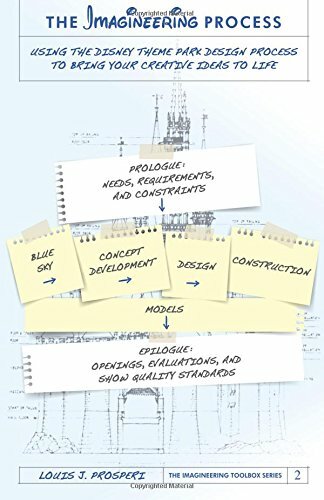 You'll learn how to begin as the Imagineers begin, with an evaluation of needs, requirements, and constraints, and then you'll delve into the six stages of the Imagineering Process: blue sky, concept development, design, construction, models, and the "epilogue," where you hold your "grand opening" and assess the effectiveness of what you've built. From there you'll see the process in action through a selection of interesting case studies drawn from game design, instructional design, and managerial leadership. At the end of your master class, you may not be a bona-fide Imagineer, but you'll be thinking like one.